Louisiana residents must register their vehicles with the Office of Motor Vehicles. You can go in person to register and have the option to personalize your license plates. You must visit the Office of Motor Vehicles (OMV) to register your vehicle and acquire license plates. Depending on the types of plates you want, additional documents and fees may be required. In Louisiana, you’ll require T-Markers (i.e. Temporary Plates) to all you to drive legally until your official license plates are prepared. You’ll have 60 days to use these T-Markers and they must be removed and recycled once you have received your vehicle’s plates. 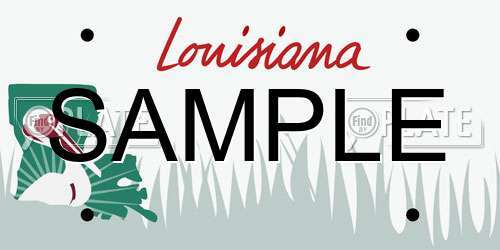 If you have no preference, you’ll receive a set of standard Louisiana license plates which is white with blue lettering and the state name across the top in red. Alternative, there are a variety of specialized license plates you can choose for your vehicle. For those with a disability, you can apply for a special permit that allows you to park in disabled parking spots. These license plates are issued only to those with permanent disabilities. Personalized license plates must be approved by the Louisiana OMV prior to being issued to you. You can check to see if the plate number you want is available online. The fees for personalized plates are $25, plus $3.50 administration fee, $8 handling fee, and standard registration fees. You will only have to pay if your personalized plates are approved. You must renew your Louisiana license plates every 2 years. To do so, you can submit your application by mail, online, or in person to the nearest OMV. You’ll receive a new set of decals to be placed over the old ones on your license plate. Renewal fees vary per person and vehicle. It takes up to 30 days to get your license plates replaced if they were stolen or lost. You must visit your nearest OMV, in person, to apply for replacements. File a report with the police immediately if you believe you license plates have been stolen. Doing so reduces the likelihood of your plates being abused by the wrong people. The fees associated with transferring your license plate vary by office in Louisiana. Contact your OMV for more information. There may also be taxes, services fees, and other fees to register your vehicle in Louisiana. In some cases, you may want to perform a background search on a vehicle to discover whether it was stolen or severely damaged. You can look up license plates in Louisiana online to get a brief background check. This can help you when making a decision when buying used cars from private owners. Additionally, you can use FindMyPlate to lookup available plate numbers for your own personalized license plate.